Festival trailers and tents become submerged in flood waters during the Whitetail Deer Festival in Rarden Saturday afternoon. The weather has changed many plans this weekend. 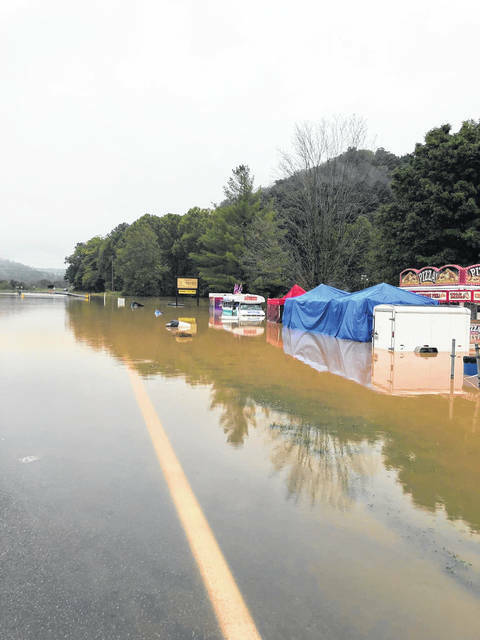 As much as 4 inches of rain was predicted to fall on the area Saturday and Sunday, leaving roads closed, as well as businesses, and events being cancelled. 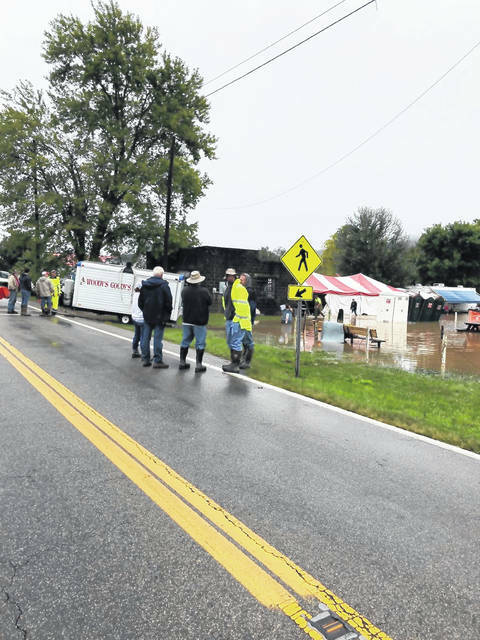 The White Tail Deer Festival in Rarden was cut short Saturday afternoon as the flood waters creeped up and eventually took over the park where the festival is held each year. U.S. 23 South is restricted At Portsmouth. Accordi ng to the Ohio Department of Transportation, U.S. Route 23 South in Scioto County has been reduced to one lane near the 3.6-mile marker, just north of the Portsmouth corporation limit, due to a pavement slip. The route is reduced to one lane in the southbound direction between T.R. 162 (Lowry Hollow Road) and C.R. 38 (Scioto Trail) where a slip has occurred along the shoulder. Northbound traffic should not be affected by this restriction, and motorists are advised to use additional caution through the area. S.R. 335 in Scioto County at the corporation limit of Portsmouth was closed due to a landslide. The duration of closure is unknown; however, it is anticipated that the route will be closed through the overnight and much of Saturday. Motorists will be detoured via U.S. 52 and S.R. 139. In addition, SR 104 was closed near the Elks Country Club and SR 73 was closed in Rarden at the site of the White Tail Deer Festival. Heavy rains fell all day Saturday and into the early morning hours of Sunday, leaving trees on power lines resulting in over 1,500 homes without electricity Sunday morning. Kim Carver, director of the Scioto County Emergency Management Agency released a report saying flood warnings throughout the area were in effect until at least this morning. https://www.portsmouth-dailytimes.com/wp-content/uploads/sites/28/2018/09/web1_Festival-1.jpgFestival trailers and tents become submerged in flood waters during the Whitetail Deer Festival in Rarden Saturday afternoon.